Pumpkin pie is perfect for autumn and you can wow your friends and family with this perfect pumpkin pie recipe. Some pumpkin pie recipes call for "pumpkin spice mix" that you can find at the store. 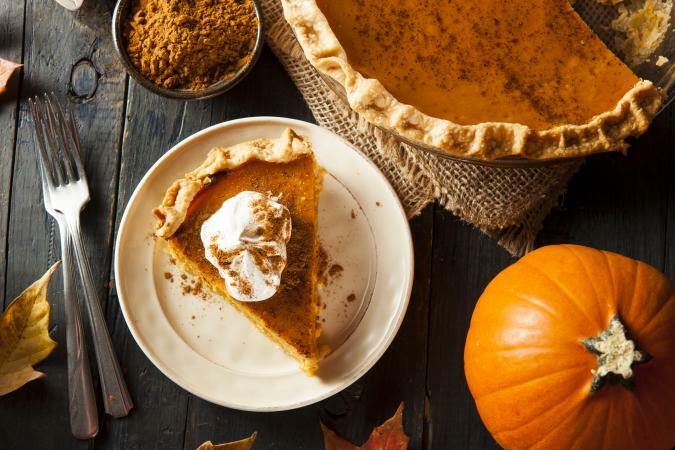 If you already have ground cinnamon, ground ginger, and ground clove in your spice rack, you have all you need to spice up your pumpkin pie recipe. You can, if you like, add freshly ground nutmeg to the mix. It will add a nice seasonal taste to your pie. You can use one 13-ounce can of pumpkin puree to make your pie, or you can make your own puree from scratch. There are several ways to prepare a fresh pumpkin for your pie. You can steam or boil the pumpkin, or you can roast it. Roasting the pumpkin usually yields better results because steaming or boiling tends to create a wetter pulp which needs to be drained before you use it. To roast a pumpkin for puree, you will need to buy a "sugar" or "pie" pumpkin. These pumpkins are usually smaller than the kind you get for carving. For this recipe, you will need a 4-pound pumpkin. Wash your pumpkin to get all the dirt off of it. Scrape out the seeds and the stringy stuff. If you want to roast the seeds later, save them now. Coat the insides of the pumpkin with vegetable oil. Place the pumpkin sliced-side down in a roasting pan. Add enough water to come up about a half inch on the pumpkin. Bake the pumpkin for 1 1/2 hours until it's tender. You can test it by poking it with a knife. Remove from the oven and let cool on a rack. When cool, scoop out the pumpkin flesh. You can mash the pumpkin flesh by hand or drop it into a food processor. Place the puree into a strainer lined with cheesecloth and let it drain for 1-1 1/2 hours, stirring occasionally. The puree should be thick with most of the water drained out. You should end up with about 1 1/2 cups pumpkin puree. You will need 13 ounces (which is a little less than two cups) of puree for this pie. If you cannot find fresh pumpkin, use the canned puree. One 13-ounce can will do. Any pie crust that you like to use will work fine. I like to use a basic pie crust recipe, but you can use pre-made if you like. Whichever pie crust you make, you will have to blind bake it. Blind baking is used when you are cooking a custard or a fruit pie that has a very wet filing. It is done so the crust does not get soggy from the filling. Pumpkin pie is a wet pie filling so we will blind bake the crust. If you happen to have some plastic wrap and some uncooked dried beans handy, you have all you need to blind bake your crust. Place the plastic wrap over the piecrust and then fill the crust with beans. Wrap the plastic over the beans so that the beans are secured in the plastic. Bake the piecrust for 10 minutes at 425 degrees. Using a pair of tongs, remove the beans from the piecrust and continue to bake the pie crust for another 10 minutes. The crust should be golden brown. Remove the crust from the oven and let it cool completely before adding the pie mixture. In your stand mixer, add the pumpkin puree, sugars, and spices. Add the egg yolks, followed by the milk, cream, and water. When the mixture is smooth, pour it into the pre-baked piecrust. Bake at 350 degree Fahrenheit for one hour, checking it at 45 minutes. When finished, the pie will be soft. Remove it from the oven and let cool. When the pie is fully set, top with dollops of Chantilly cream and enjoy.